When a Midtown homeowners association made Michael Bryan take down the sign in his window supporting Howard Dean for president earlier this year, Bryan struck a blow for thousands of homeowners in the Tucson area. Bryan, who was finishing law school at the University of Arizona, did some research and found out that the no-signs rule in the Crest Ranch Homeowners Association, near North Campbell Avenue and East Prince Road, had state law on its side. So Bryan talked to Rep. Tom Prezelski, D-Tucson, and they changed the law. Bryan put up another political sign in front of his home on Wednesday, a day when eight of 10 new state laws took effect to regulate homeowners associations. fought the rule in the Legislature - and won. 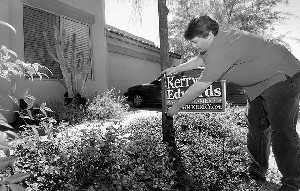 homeowners associations in Arizona must permit political signs around election time. The new laws also expand other rights for homeowners and require associations to assume more of the responsibilities of public governments, such as holding open meetings and avoiding conflicts of interest. More changes may be on the way, according to two Tucson-area state representatives who helped sponsor much of the recent legislation, as HOA issues continue to be a topic in the new legislative session. The new laws were prompted because disputes between homeowners and associations aren't limited to whether it's appropriate to put up red, white and blue pieces of cardboard before an election. In some cases, associations have threatened to foreclose on a member's home for violating association rules or failing to pay dues. Associations can exercise power in matters large and small. In 2000, the Ladera Brisas Homeowners Association on the West Side sued a property owner on grounds that a dog barked too much during the night. The court ordered the dog removed from the property, and the couple was asked to pay about $1,100 in fines and legal costs. Several ongoing cases in Pima County Superior Court involve the Kino Meadows Homeowners Association, which has threatened to foreclose if residents don't pay their dues. HOAs often wield as much power over people's everyday lives as city governments or school boards, said Rep. Linda Lopez, D-Tucson. Associations exist to help increase property values by fostering attractive, well-maintained neighborhoods. "They need to be accountable to their membership," Lopez said. "And they need to be responsible." To that end, some citizens and lawmakers are asking that the state subject HOAs to some of the same checks and balances as public governments. The laws that took effect recently apply to the roughly 650 homeowners associations in the Tucson area. No exact figure exists for the number of homeowners in Pima County who belong to an HOA. If Tucson follows the U.S. average, at least 25,000 homeowners in Pima County belong to an association. If Tucson is closer to Phoenix's rate for association membership, then about 100,000 homes in Pima County belong to an HOA or condominium association. About 233,000 households in Tucson own their homes, according to the U.S. Census Bureau. Stephen Weeks, a Tucson attorney who represents homeowners in disputes with associations, said most HOAs act as citizen democracies, but a few fall prey to "mini-dictators" who may abuse authority to enforce rules and levy fines. ● Property owners could be denied a chance to speak at HOA board meetings, a right that's always given at school board and city council public meetings. ● HOA boards could close meetings to homeowners to discuss board rules or policies, something usually not allowed in public government. Other changes are designed to make sure people understand their HOA contracts before they join, and to protect against foreclosure from overzealous association board members. "What we see in Arizona is a drive toward transparency," said W. Grant Parker, president of the board of directors of the Southern Arizona Chapter of the Community Associations Institute, whose members manage 146 homeowners and community associations locally. As HOA membership is becoming more common, Parker said, more people are asking about the proper balance between protecting property values and preserving individual freedoms. "It's boiling down to a debate between property rights and individual rights," Parker said. Weeks said boards that become too inflexible about rules can produce lawsuits from frustrated homeowners trying to resolve disputes. Weeks has represented clients in disputes stemming from whether a landscaped yard or a renovated driveway conforms to association rules. Boards often have the right to fine members for violating their HOA contracts. Fines can run $100 or more for a violation, and often can be imposed monthly. Weeks said disputes occur infrequently, and that most associations work well. "For the most part, it's a good thing," he said. "Community associations improve property values. They do help out; you don't want somebody moving down the street and painting their house polka-dotted. It's not desirable." Parker agreed that legal disputes are rare, but said it's not surprising that homeowners associations have become a topic of interest. "You're talking about people's homes, their money and their lifestyle," he said. Money can be a key sticking point. Most associations collect dues - often called assessments - from property owners for community upkeep and other services. Dues can range from a few dollars per month to thousands per year. Continental Ranch property owners pay about $10 per month, while members of SaddleBooke's HOA No. 1 pay $100 per month, which helps fund a fitness center, arts and crafts, and neighborhood security services. The national median is $26 per month. Most Tucsonans who have bought a new home in the past 10 years, or are buying one now, end up joining an association, said John Strobeck, a Tucson housing analyst. Production builders usually start HOAs as part of new neighborhoods or subdivisions, he said. "I think it's almost exclusive that they do it," Strobeck said. "I don't know of any that don't." *Attend and speak at board meetings, which now must be open to homeowners in most cases. *Put up political signs in yards within 45 days of an election. *Challenge the action of an HOA board without gathering signatures from other community members. *Find out who's in charge of the association by checking with the county recorder. *Read an annual audit of the association's finances and read records from meetings (effective Jan. 1, 2005). *Overturn a board decision if a board member awards a contract for compensation to a relative or family member. * Buy a home in an association without first being allowed to read the association's rules and bylaws. *Be foreclosed upon if an association fines a homeowner for violating association rules. *Stop paying assessments, since that still may result in foreclosure. ● A property owner agrees to join an association as part of buying a house, condominium or town home in some neighborhoods or subdivisions. Most associations collect fees and spend the money according to the community's wishes, which may include road repair, landscaping and maintaining neighborhood parks, swimming pools or tennis courts. A homeowners association also has the power to enforce community rules and fine people who don't follow them. Why can't people break HOA rules? ● First, people sign a contract agreeing to follow the rules and often agree to pay fines if they break rules. ● Second, associations may foreclose on property holders who refuse to pay association dues. ● Homeowners don't pay their association dues, known as assessments. ● Violating architectural standards by using unapproved paint colors, sheds or shutters. ● Cars and trucks parked in no-parking areas. ● Maintenance issues, such as unmowed lawns, landscaping that doesn't conform to association rules, or yard debris that isn't cleaned up. ● Pet problems, such as barking dogs. ● Flags, banners or signs that violate community rules. As HOA membership becomes part of buying new homes here, some owners are asking for associations to be more responsive to the concerns of citizens. Marty Ledvina, who lives in Continental Ranch, took his community association to court in 2001. Ledvina, a retired attorney, city attorney and administrative law judge, wanted to see how much the association was spending on attorney fees. Ledvina said the association bylaws gave him the right to find out. After about $2,500 in legal bills in court, a Pima County Superior Court judge sided with the association. "They spent hundreds, thousands of dollars trying to keep me from getting the information," Ledvina said. Under the new laws, homeowners have greater access to records on association meetings and finances. Ledvina said he'd like to see further changes to allow property owners to challenge an HOA in small-claims court, which would lower the costs of a legal challenge. Ruling "with an even hand"
Other HOA members support the job that their associations do. Cliff May, 82, has belonged to a town-home association in Midtown since 1987. The board has historically ruled "with an even hand, as opposed to an iron hand," May said, adding that the quality of an association depends on the fairness of its board. "I feel that with the best membership possible, it's very advantageous to have an association," May said. Rep. Ted Downing, D-Tucson, helped sponsor six of the new laws, and said that more legislation may be on the way in the new session. Downing said he'd like to try to stop HOA board members who use their position to enrich friends or relatives by giving them contracts for services like pest control or landscaping. Such conflicts of interest would be forbidden in the public sector, but Downing said many people don't know that the rules that apply to government may not exist in HOAs. "Governments don't quite have the same powers in an area where the homeowners association is," Downing said. "A lot of people are moving to Arizona who are unfamiliar with this type of arrangement when they buy a home. I think they come here and they don't understand what they bought into until they're there. Lopez said the state needs to look at a way to help homeowners and associations settle disputes without hiring lawyers. "Should there be some kind of mediating third party?" Lopez said. "It seems to me we need something else."